This is the perfect gift on Birthday, Graduation, Christmas, Anniversary, Wedding. 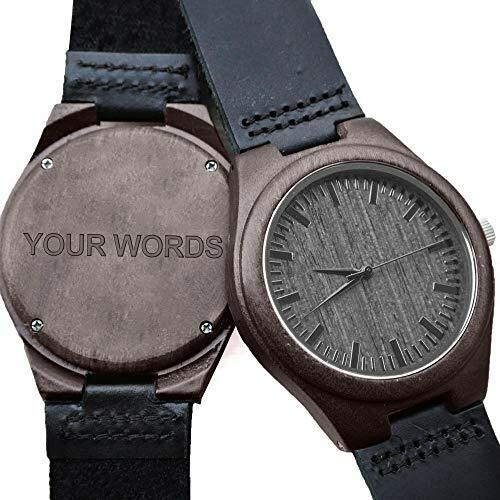 ★★★The watch's case is made of 100% natural wood; with no harmful chemicals or paints were used. The band is Genuine leather strap. Lightweight and comfortable on the wrist. ★★★Daily Life Waterproof,Can Bear Sweat,Accidental Rain Or Water Splash,Can't Swimming,Diving. ★★★This wooden watch is equipped with precise Miyota quartz watch movement, developed in Japan and considered to be one of the most reliable and versatile watch calibers in the industry. ★★★This is the perfect gift on Birthday, Graduation, Christmas, Anniversary, Wedding. If you have any questions about this product by Kenon, contact us by completing and submitting the form below. If you are looking for a specif part number, please include it with your message.